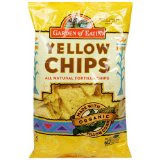 Shop at Amazon.com and get a great deal on Garden of Eatin’ Organic Chips. Make this deal even better by taking advantage of the mail-in-rebate to get a $10 Barnes and Noble gift card! at $16.98 each. 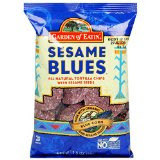 This makes the Yellow Chips only $1.28 a bag and the smaller bags of Sesame Blues 71 cents each. You’ll get free shipping when you buy two 12-packs. Then complete the rebate form by October 7, 2009, and you’ll get a $10 Barnes and Noble gift card. Don’t want to buy that many chips? You can buy one 12-pack of the Garden of Eatin’ Yellow Chips or one 24-pack of Sesame Blue Chips, pay 99 cents shipping, and still get a $5 Barnes and Noble Gift card. Don’t forget: If you have some Swagbucks to spend, you could get turn this deal into a money-maker! Special thanks to Jessica from Save Green Being Green for sharing this deal!